Since August this year, I keep going to collect a huge volume of qipu/kifu (weiqi game record). And then trying a lot of solution on my part to manage the weiqi qipu overload. After remove out duplicate copy thru centralise into the estone single database, I have 20,000 qipu with me on the Professional play. Which I use with the Kombilo for the study for the move, and pattern searching to see how professional response in certain move. And now, I finally have settle down the solution I use. After today, I will perform clean up on my qipu collected (end 2003/Dec/31) to enable me have Pro qipu up to 2003/Dec/31 via Multi-go batch processing to ensure the volume of qipu is error free and sgf4 compliant. Then all once again import into the estone single database for edit game information, and sorting according to years or month, or player or by title play. Then export out again according to the year and month folder. Then feed them for the Kombilo and check for the illegal move problem, if yes, try to corrected it or remove the qipu to ensure accurate and qulity of the qipu database. Then, maybe my next move is to make kombilo and all the various weiqi tool runnning inside the cd, so I can run it remotely on all the pc I access-able. Qipu update only on future like quarter or yearly basis. Since Pro database is in place, it is enough for the study of the Pro move and analysis of pattern. Update on yearly basis is just to see the trend on certain joseki change. 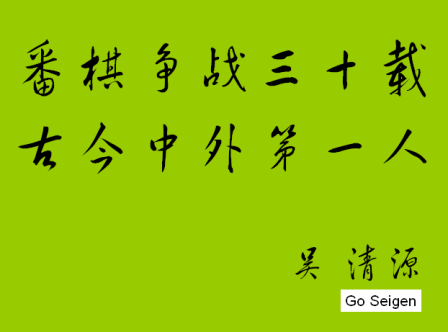 Today just think to write a chinese poetry to express my respect on the Mr. Go Seigen. He outstanding performance on the 10 rounds game, and really postone and defeat all the strongest player within thier peak performance period for 30 years. During Go's peak performance period, he play just motivate me and enlight me. Even later he facing accident cause problem in his head (which I'm think affect his mental skill), and till now still researching on the 21st century way of play weiqi. His life is just an outstanding example to be learned from. Upcoming will have a chinese movie about his story will be show on the chinema - title 《棋圣 吴清源》(translate: Kisei Go Seigen), which I highly expect to have a look to see what different on the movie compare with his real life story. Mr. Go already fly to China and approve the script of the movie during last year. Today morning surf the Internet and see a personal homepage by Japanese worth to note for (http://www9.plala.or.jp/mrkigo/ ). The website author is really present the content in very unique way, and i like the way using java applet to illustrate kifu and the move sequence. Another weiqi's website worth to note for is Go Masters (http://www.bamboohut.jp/ ) have lot of kifu (weiqi game records to download as well). I particular like the website way of present the title match in the table forms. Both of the website give me new ideas on how to present the content better. This week my work pc harddisk failure, cause a lot of data accumulated gone. Hopefully some important data is reserve in hardcopy mean, so take it as "super house keeping" to help me stay clean. As see on the harddisk, it already over 3 years all, and no wonder it is "out of service". And I want to say now day, producer is very high tech and able to produce harddisk in the quality in the proper period "quality within time period", and force user to buy a new one. With this lesson, play to backup home data into remote mean like cd disk to prevent this happen, it is really a pain experience, especially important data is gone without any mean able to recover it. And now is Year end again, and it is time for life plan workshop again to realign the changing life situation with the life goal again. And it is time to plan ahead for the better future. I predict my wife will born my first child within this few day or up to one week time, get excite and stress. Because need to re-alignment existing relationship again. And more responsibility is given as life situation is change. Feed and teach child for a meaningful life lesson is no an easy tasks, but I know the life call is on, and need to act upon. Be proactive, build up and manage a happy family life units. I'm now start to use the Kombilo 5 for the pro-games researching, and help me know more on what text book is talk about, and what professional is playing on their own games. During the researching on the pro-games to find out the pattern of the play, really helpful for me to judge which area should be major study area, as % of play on the pattern is high, and study alternative option of play. Highly expect next version of Kombilo is have more functionality to help in researching.